"Dimensions 105 x 142 feet." 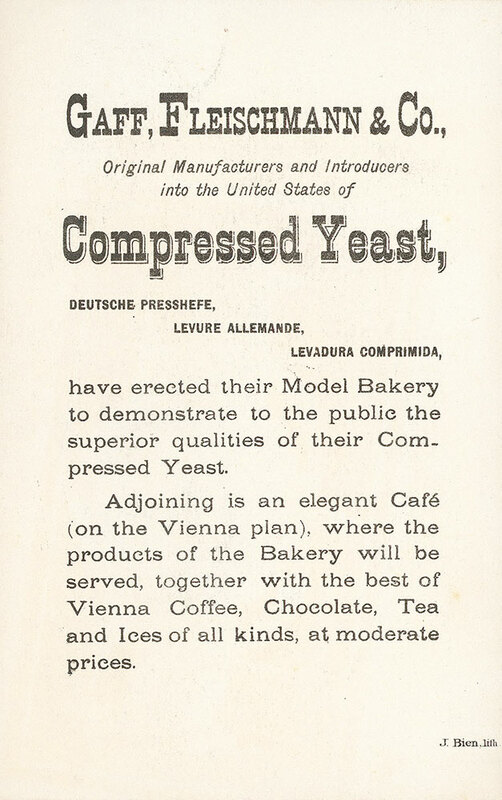 "Gaff, Fleischmann & Co., original manufacturers and introducers into the United States of compressed yeast, deutsche presshefe, levure allemande, levadura comprimida, have erected their model bakery to demonstrate to the public the superior qualities of their compressed yeast. 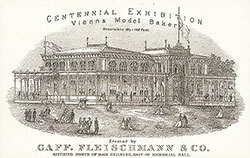 Adjoining is an elegant caf'e (on the Vienna plan), where the products of the bakery will be served, together with the best of Vienna coffee, chocolate, tea and ices of all kinds, at moderate prices." -- Verso of card. 1 trade card : 10 x 15 cm. Exhibit title: Gaff, Fleishmann & Co., Blissville, Long Island, N.Y., Vienna Bakery, or Compressed Yeast Building, Bldg #105. 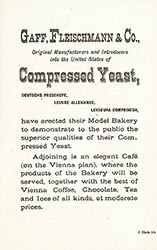 Trade card for Gaff, Fleishmann & Co. products made with compressed yeast. Recto: Vienna Bakery building topped by banners and surrounded by people. Verso: text. Black on white card.